Are you ready for an adventure of a lifetime? 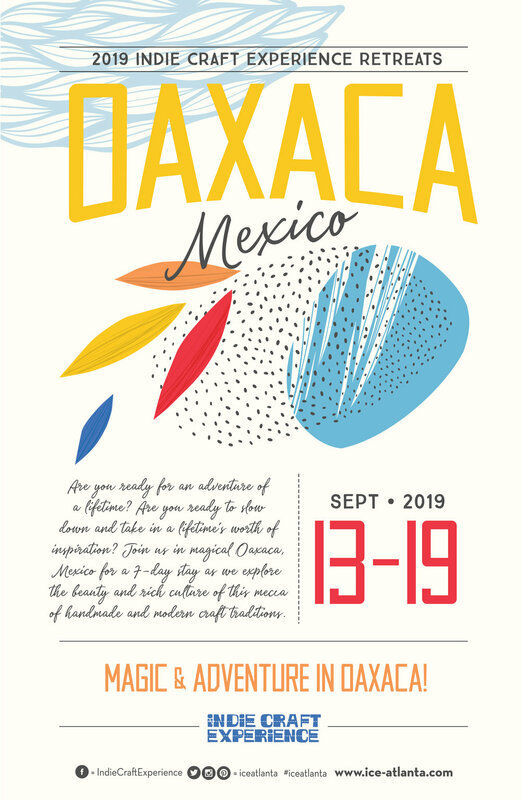 Join us in magical Oaxaca, Mexico! We were drawn to Oaxaca for its beauty and design, delicious food, and rich culture. It’s a mecca of handmade and modern craft traditions. We can’t wait to share this experience with 10 guests during this wonderful retreat. Are you ready to slow down and take in a lifetime's worth of inspiration? We will spend our time wandering the winding cobblestone streets of Oaxaca City, taking in the colorful colonial architecture, visiting museums, and cultural sites. We will visit contemporary artists and makers while taking part in private hands-on experiences in the studios of local artisans. We will venture out and explore the surrounding mountains and countryside, visiting the makers in surrounding villages that bring the magic to this area including handwoven rugs, embroidery, the colorful wooden alebrijes and shining black pottery of San Bartolo Coyotepec. We will explore the ancient Zapotec ruins of Monte Albán and shop in the centuries old Tlacochahuaya market. We will travel to the art community San Agustín Etla founded by Francisco Toledo and visit the museum and cultural center there. Each day will include a different itinerary, which will be provided to our guests. Some days we will be exclusively in Oaxaca City and other days we will adventure in surrounding areas. There will be also be some time for you to explore Oaxaca City on your own. You’ll be joining Shannon Mulkey Green and Christy Bardis Petterson on this adventure! For the past 15 years, Shannon and Christy have organized a craft and vintage market in Atlanta, GA, called the Indie Craft Experience. Their mission has been to provide opportunity to artists from the Southeast and beyond. They are both Teaching Artists at the High Museum of Art and also teach workshops regularly at their studio in Candler Park, a historic intown Atlanta neighborhood. They are both Atlanta natives and life-long artists, with a recent focus on natural dyeing. Shannon and Christy have both spent time in Oaxaca and can’t wait to share this adventure and their love of art and creativity with you! We are staying at the magical Casa Colonial in the heart of Oaxaca City, a sprawling colonial style home in the historic city center. "The Casa" has well-designed colorful rooms, covered verandas, lush tropical gardens, a gracious living room and library, delicious Oaxaca home-style food, and a welcoming staff. Daily breakfast will include eggs made to order, freshly squeezed orange juice, an array of tropical fruits, toast, oatmeal, granola, yogurt, Oaxacan coffee...all served in the beautiful dining room, with views of both the front and back gardens. Eight guests will stay in double rooms at Casa Colonial. Everyone has their own bed, and if you are traveling with a friend let us know when you register so we can place you in a room together. We also have two private rooms available. The retreat costs $2,750 for guests staying in a double room, and $3,250 for guests staying in a private room (only two available). You can reserve your spot at the retreat by paying a non-refundable fee of $500, which goes towards your total. Once we receive your deposit we will set up a payment plan with you. Photos of Casa Colonial are property of the inn. After we receive your non-refundable deposit of $500, you will receive an email with the option to pay your balance in full or arrange a payment plan. Your payment plan will be determined by the date you sign up. All payments must be completed by August 15th, 2019. We recommend it, just in case. When booking your flight please fly into Oaxaca Xoxocotlan International Airport, Oaxaca OAX Airport. Allow ample time to research airlines and book ahead for the best rates available. A passport is required to travel to Mexico. Your passport must for valid for 6 months AFTER your return date. Please check your expiration date immediately. We will arrange group transportation from the airport on September 13th and to the airport on September 19th. If you choose to arrive earlier or leave later transportation is your responsibility. Oaxaca is a global culinary destination. It’s the birthplace of mole sauce. There is delicious frothy hot chocolate and artisanal mezcal. You can be as adventurous as you want to be! Please inform us ahead of time if you have specific dietary requirements. Wifi is accessible throughout Casa Colonial rooms and their common areas. Although it is available throughout the property, at times Wifi may not be as strong as what you are used to at home. Check with your cell phone carrier to see if they offer an extension to cover Mexico. There are ATMs throughout Oaxaca City. Many shops and restaurants accept credit cards, but you will need cash in the markets. You can exchange money at the airport to get the best rate. We will provide all supplies for workshops. You may want to bring your favorite journaling tools, pens, markers, colored pencils, and any other art supplies that bring you joy. The weather will be mild with average highs around 81° and lows around 58°. You will want to bring light breathable clothing and a light jacket or sweater for the evening. Temperatures can change quickly. Closed-toe and comfortable shoes are must-haves for long days of exploring. It’s also handy to have flip-flops or sandals. Bring a sun hat and plenty of sunscreen. Because of all the thought and care that goes into planning a global retreat, we can not offer refunds. For your own peace of mind you may purchase a 'cancel for any reason' travel insurance policy. If you do not see a submit button at the bottom of the registration form, please go here to register.